In the Martin & Sylvia: Saturdays! story this week, "Rainbows", Martin & Sylvia are disappointed that weather is threatening to ruin their summer barbecue plans. We all know how that is! Rather than letting the weather sour their moods, they decide to make rainbows out of the rain. It’s hard to be grumpy when surrounded by all the bright and beautiful colors of the rainbow! And it’s impossible to be grumpy when you have a rainbow popsicle in your hand! With summer upon us, I always like to have a batch of popsicles in the freezer. That way I’m ready to pop a few out at a moments notice – whether to cool down on a hot day, brighten things up when we have a case of the grumps, share with unexpected summer visitors, or serve at the end of a good grilled meal. While Martin & Sylvia didn’t have rainbow popsicles for their barbecue, I’m sure they would approve. Choose your fruit. Start by selecting fruits in all the colors of the rainbow. Make an event of it, walking the produce aisles looking for things that fit the bill. Wash and chop the fruit. You’ll need to chop the fruit into small bits, to make sure that it’ll fit into your popsicle molds in nice layers. You can invite your little one to help with the chopping; butter knives will do the trick for most of the produce – strawberries, blueberries, kiwis, etc. Layer the fruit into the popsicle molds. 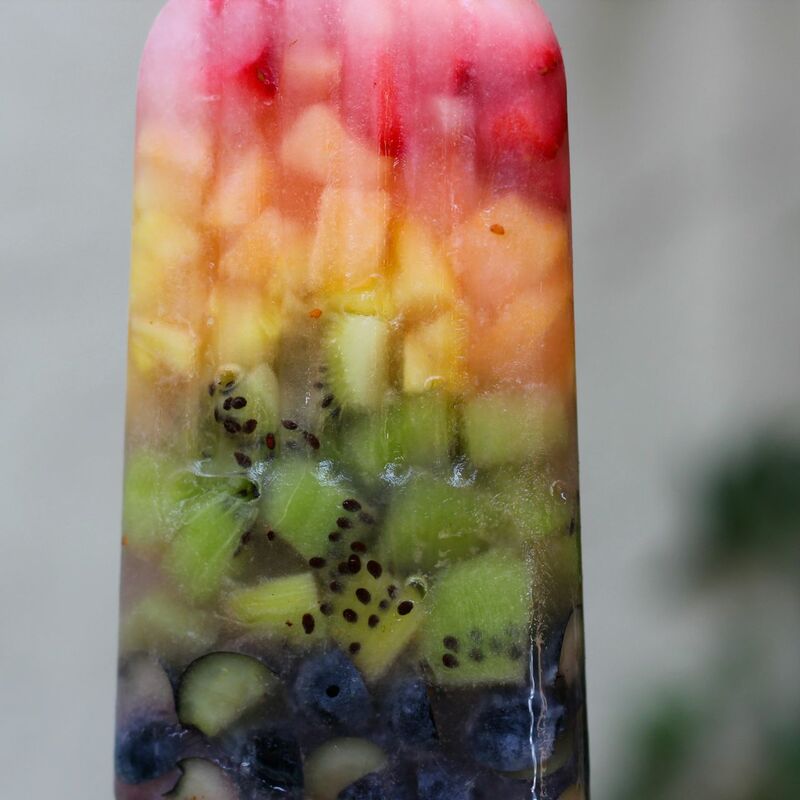 Carefully layer the fruit you chopped into your popsicle molds. If you want them to be rainbows, you’ll need to go in rainbow order: red-orange-yellow-green-blue-violet. Fill the popsicles. You’ll want to choose a clear-ish liquid here so that you’re able to see the rainbow! Lemonade works well, if you want your popsicle to be a bit more sweet. If you want the fruit to be the focus, give coconut water a try. Once you’ve made (and eaten) your rainbow popsicles, you might want to make a new batch. What other kind of popsicle would you like to try making? How will you do it? What ingredients will you need? Perhaps you’d like to plan an entire rainbow meal. You can make rainbow kebabs, like Martin & Sylvia, and rainbow popsicles. What else could you make? In the story, Martin & Sylvia were disappointed when it looked as though their plans would be ruined by the weather. Daddy encouraged them to come up with a solution, rather than dwelling on the situation that they couldn’t change. Have you ever felt like Martin & Sylvia? What did you do? Andrea Folsom describes herself as a writer, editor, creative maker, and eternal optimist. She is passionate about learning and sharing new creative techniques, making beautiful spaces, and talking about the social-emotional benefits of creativity and art. She runs Crafting Connections - a website providing inspiration, practical advice, and projects for creative families - with her close friend Danielle Reiner. Danielle Reiner describes herself as a creative, a maker, and a mama. At the heart of her story is creativity, though that hasn’t always been the case. She rediscovered her deeply hidden creativity early in adulthood – with a ball of yarn and a couple of knitting needles – and hasn't stopped since. Danielle also runs Crafting Connections - a website providing inspiration, practical advice, and projects for creative families - with her close friend Andrea Folsom. Saturdays are special days for our creative brother and sister. From enormous art projects in their own backyard to “explorers” adventures up Mooseberry mountain; from mornings of quiet building along the creek, to whole-family canning adventures in the kitchen, the children find fun and inspiration at every turn. With each story you can enjoy: 1. A CRAFT or PROJECT on the Sparkle Blog inspired by the week’s story. 2. And a PRINTABLE PROJECT PAGE for more creative fun.